I was rung up after my report on the Oz GP was published last week, by regular reader Peter Wehrli complaining about the fact that I had not mentioned BMW in my scribblings. His contention was that considering that BMW had managed to get both cars home, a feat only equaled (or bettered really) by Renault, I should have given credit where credit was due. Of course, there was no excuse for this oversight, other than the fact that the two BeeEmms never seemed to feature in the telecast. 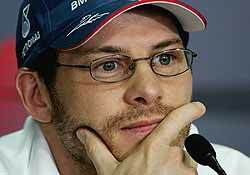 Reliability seemed to have blessed the BMW engine (for the first time) and Jacques Villeneuve seemed to have avoided hitting anybody (almost for the first time too it seemed)! For those two facts alone, I suppose I stand culpable. Sorry Peter, but let’s see if they can continue like that. Fuel oil – is the end in sight? With all the to and froing going on in the Middle East, revolts in Africa and South America, the price for crude oil continues to set new records. A couple of months ago we were reeling when the price per barrel went past $50. Now it is breaking $70. Tomorrow it will be in triple figures, (or at least by the end of this year). So what does all this mean? Is the end in sight? Quite frankly, no. But it does signal the end of cheap fuel at the pumps. Even my little Mira which used to take B. 300 to fill, now is over B. 500. However, it does amaze me that the fuel companies have managed to come through all this looking like ‘clean-skins’. They all have a more than vested interest in the prices going up. It’s called increased profits. The world has enough supplies of crude to maintain transportation at its present level of consumption for years to come yet. With the financial aspect being driven by supply and demand, by (artificially) emphasizing potential decrease in supply, higher prices can be charged. Perhaps I am too much of the cynic, but I do not follow the dictum that we are about to run dry. However, perhaps it is time to take the long term viewpoint. Diesel makes more and more sense. Even though the price for a liter of diesel is almost the same as for a liter of petrol, a diesel powered vehicle will travel almost twice the distance per liter, compared to its petrol powered variant. In real terms, this halves the fuel bill per week. The real economizers are the hybrids, but they are currently so expensive you would have to do a million kilometers a year to be in front in the long run. When hybrids come down in price, we will all have one. In the meantime, all you can do is drive up to the pumps – and pay up! Have you watched the WTCC? Again it was motoring enthusiast Peter Wehrli who suggested I watch the World Touring Car Championships (WTCC) for some ‘real’ action, compared to F1. I finally managed to find it on Eurosports TV, and the action is certainly thick and fast. One driver immediately brought a lump to the throat – Alex Zanardi (who lost both legs in a fearsome crash in a CART race), driving a factory BMW fitted with hand controls and who was right up there at the pointy end, challenging for the lead. 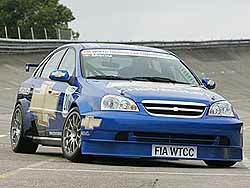 The championship rules are devised to keep everyone together performance-wise, and a Chevrolet (nee Daewoo Lacetti) Optra was even on the podium last week. SEAT had something like six factory drivers and cars, but it was an Alfa-Romeo which took top step on the podium in the race from Monza. If you can find Eurosports on your TV, the motor racing from the WTCC is excellent. However, finding it is the big problem! Thanks for the information, Peter. So to this week. Which driver lost his left hand in 1965 and returned racing in 1966 using a hook? Hint – he had 111 victories and was an American. There is some very interesting history behind the Bentley Continental GT and Continental Flying Spur (the four door variant). Really just so terribly, terribly British, but the background is more than just a little murky. The marque Bentley has always been one that has attracted folklore and mystique. The early race cars were dismissed by such luminaries as Ettore Bugatti as “the fastest lorries in the world,” despite the fact that Bentley had won the Le Mans 24 Hour race, beating Ettore’s efforts, on more than one occasion. In many ways, even since its inception in 1919, Bentleys has been an anachronism, vehicles appealing to the very rich with a need for speed. The problem for Bentley back then was that there were not enough people with deep enough pockets after the economic crash in the 30’s (yes, there has been more than one economic crash, other than the SE Asian one of 1997, may your NPL never be repaid), and Bentley Cars as a separate manufacturer went under, then being swallowed up by Rolls-Royce. You are also probably not aware of the connection between Adolf Hitler and the Bentley marque. This one is even more esoteric, but it was Volkswagen, the car of Adolf’s dreams, that came to rescue Bentley (yet again) from another financial morass. By that time, both Adolf and W.O. were long gone (fortunately for both, and for us) when in 1998, following a most complicated buy up and division of assets, Rolls-Royce ended up under BMW, while Bentley went to VW. However, no need to be confused over what VW are doing with Bentley. 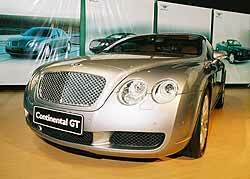 In 2004, they launched the (new) Bentley Continental GT. 52 years earlier Bentley had produced a very exclusive version of the Bentley. It was a full four place motor car, with the Fastback having an exceptionally advanced body design from the coachbuilders H.J. Mulliner, and marketed as the fastest production four-seater in the world. Only 208 were built, and it was called the R-Type Continental. 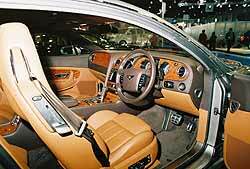 In 1991, still as part of the Rolls-Royce conglomerate, the Bentley division reintroduced the Continental. This was another two door with a 385 bhp V8 engine later rising to 420 bhp. These were again gentlemen’s sporting carriages. But the best was yet to come. With the release of the 2004 turbocharged Bentley Continental GT, it was again the fastest four place production car in the world (it peaks at just 2 mph short of the magical 200 mph ‘double ton’) and its technical specifications are superb. Acceleration times of 4.8 seconds for zero to 100 kph and a top speed in excess of 300 kph put this vehicle in real supercar territory. Despite costing around 21 million baht in Thailand, it is also appreciably cheaper than other supercars, and since it carries four adult-sized people (not a 2+2 legless midgets like a 911 Porsche) it represents a motoring milestone. An expensive motoring milestone. The technical data reveals an exciting motor car, beginning with the engine. This is the parent manufacturer’s W12 cylinder engine (72 degree angle between two main banks, 15 degrees between staggered cylinders), bore x stroke 84 x 90.2 mm, capacity 5998 cc; 4 valves per cylinder, 4 overhead camshafts; Bosch Motronic ME7.1.1 digital engine control, twin KKK turbochargers (0.7 bar boost), air to air intercooling, delivering 552 bhp/411 kW at 6,100rpm, torque 650 Nm (479lb ft) at 1600 rpm. If your eyes have glazed over reading that, sifting through the ‘engineer-speak’, the engine is like two V6’s side by side (to make it a 12 cylinder) and working on one common crankshaft. At four valves per cylinder you then end up with 48 valves, being actuated by four camshafts (one for each bank). Despite only being 6 litres in total capacity, it delivers almost 100 horsepower per litre, and staggering amounts of torque. Whilst not delivering the 900 Nm of a Maybach, 650 Nm is enough to tow the new D2 hotel in Chiang Mai at least half way through the Thapae Gate! To deliver the torque to the ground, the GT uses a 6 speed ZF 6HP26 automatic gearbox and all-wheel drive with a central Torsen differential, complete with ASR electronic traction control. AWD is also another milestone for Bentley. Gear changing is via steering wheel paddles and the driver can decide on conventional automatic or clutchless manual gear changes. The electronic and mechanical sophistication expected in a supercar continues all through the vehicle, with independent suspension front and rear; air springs, Bosch ESP5.7 electronic stability program; TEVES ventilated disc brakes front 405mm diameter (15.9in) and 36mm (1.4in) thick, back 335mm diameter (13.2in) and 22mm (0.9in) thick, anti-lock device plus HBA (Hydraulic Brake Assist) and EBD (Electronic Brakeforce Distribution), and MSR drag torque control. Like the Bentleys that preceded the new GT, this Continental is an imposing vehicle, with a wheelbase of 2745mm (108.07in); sitting on 275/40R19 tyres mounted on 19 inch rims. But for the average new Bentley owner, all this sophistication is taken for granted, it is after all, what they have paid for, wrapped in one of the best looking packages on offer today. The interior again typically Bentley with several forests felled to provide the wood for the trim, and a herd of cows (12 mooers in fact) needed for the acres of leather used everywhere inside the car. But VW did not finish there, they looked back once more at traditional Bentleys and saw the 1957 Bentley Flying Spur, a four place and four door vehicle, and by stretching the Continental GT slightly, they produced the 2006 Continental Flying Spur, another four place, four door ,also shown at the Bangkok International Motor Show (which incidentally had a “Sold” sticker on it by the second day). The power plant for this new car is the same twin-turbo W-12 engine as the Continental GT, with its astounding 552 horsepower. That’s enough to launch this 5500 pounds of metal, leather, and wood from 0-100 kph in about 4.9 seconds. Not bad considering the two door takes 4.8 seconds! So what about the French Bugatti connection? Well, Bugatti also fell to VW, so the two great marques have eventually become stable-mates. VW building the 400 kph Bugatti Veyron supercar, with a price ticket that I envisage will be around 150 million baht in this country. It makes the Bentley Continental GT seem like a bargain by comparison. Perhaps I should order two of them! A two door for weekdays and the four door for family weekends!